Located 40 light years away from Earth in the constellation Ophiuchus lies a super-Earth called GJ 1214 b. A group of japanese astronomers have been studying it to find out what kind of atmospheric properties it has. The research team used Subara Telescope’s two optical cameras with a blue transmission filter to observe the transit of the super-Earth. The observation would help them discern whether the planet had an atmosphere rich in hydrogen or water. 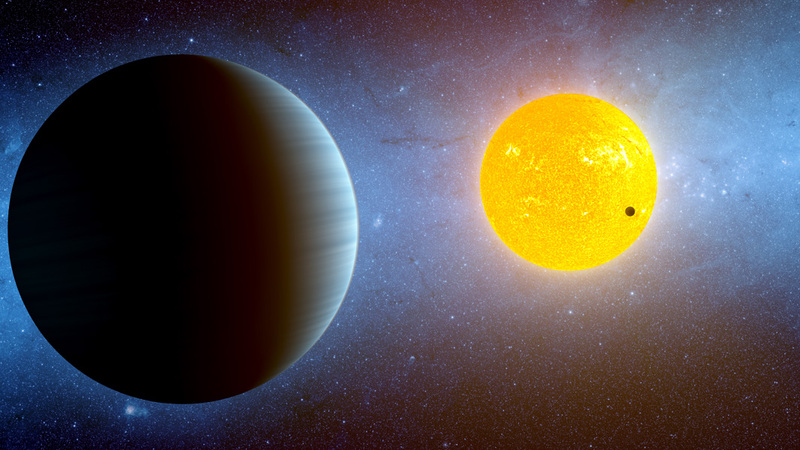 Astronomers found that sky of GJ 1214 b did not show a strong Rayleigh scattering feature, which planets with cloudless hydrogen dominated atmospheres would predict. When combined with the other observations in other colors it led the team to believe that this planet had a water-rich atmosphere. Planetary transits help astronomers investigate the change of brightness of the star which give helpful clues on the atmospheric composition. Strong Rayleigh scattering in the optical wavelength is a strong indicator of a hydrogen-rich atmosphere. The large 8.2 m Subaru telescope helped astronomers see the faint host star in highest-sensitivity ever in the bluest region. Even though the planet did not show strong Rayleigh scattering they are not discounting the possibility of a hydrogen-filled atmosphere. The japanese astronomers will conduct a follow up observation in the near future to reinforce their conclusion. In 2017 NASA plans to launch its Transiting Exoplanet Survey Satellite (TESS) which will then begin its whole sky survey of transiting exoplanets in our solar neighbouhood. The future of learning more about exoplanets will be exciting as we target more super-Earths and possibly find life on another planet. For more information you can read here. I enjoyed this article very much. Being a novice in the area of astronomy I appreciate that this article was not difficult for me to comprehend. Glad you liked it! Thanks for stopping by. Astronomy should be fun and not scary to read haha.